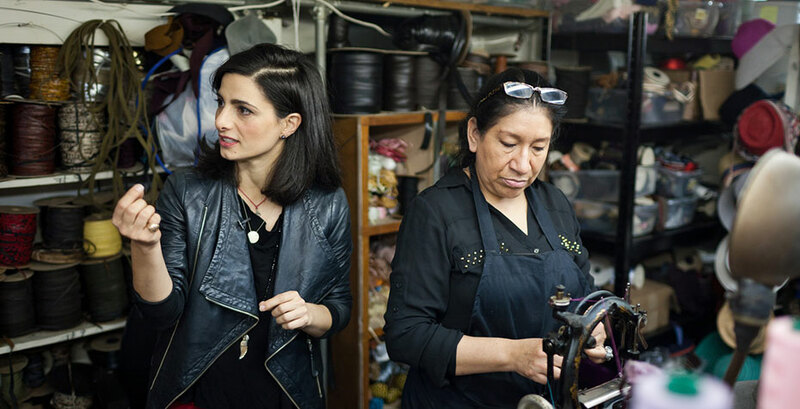 On July 8, The Today Show ran a video segment and online article featuring Satya Twena ’05, who has in the last six months been turning heads in the fashion world and beyond. On July 2, College Fashionista named her its Designer of the Month, and ran a Q&A with the entrepreneur and milliner extraordinaire. Back in December, The Wall Street Journal wrote about Twena, highlighting the fact that she had recently become the youngest female factory owner in Manhattan, and was rocking a successful Kickstarter campaign to fund the business development and preservation. Here’s how it happened. Twena majored in psychology and women’s studies and played varsity soccer at Wellesley, and went on to study at the Fashion Institute of Technology and Parsons School of Design. She was working for an interior design company in New York City in 2010 when she took a hat-making class. Making hats for fun—and then for a purpose, when her mother was in chemotherapy and lost her hair—became something of an obsession for Twena. She started selling hats from her apartment and a friend’s boutique, but soon discovered she couldn’t keep up with demand by hand-making each one. She found a venerable factory in Manhattan called Makins that still made hats largely by hand and could handle the volume she needed. Out of the blue in late 2013 she got a call informing her that the factory was closing. A few deep breaths, some borrowing, and a Kickstarter campaign later, Twena purchased the 100+ year-old factory. In doing so, she not only preserved a part of her own supply chain, but saved a historical element of New York and the jobs of the craftspeople working there. Now it is factory, show room, and event space. Indeed, anyone who doubts that fashion and intellectual life don't overlap much need only check in with Twena. As she told Glamour magazine, “I am beyond inspired by strong women like Marchesa Casati and paintings by artists like Henri de Toulouse-Lautrec. They all are great reference points and provide insights to styles and life before my time, easy to be inspired by each of them.” Twena sees each hat as not just a fashion accessory, not just a healthy sun screen, and not just a preservation of artisanal New York, but as a potential for “magic” for the wearer. New York Magazine’s 2014 Best of New York list calls out Satya Twena Fine Millinery as the best made-to-order hat to be had in the city. New York Called describes Twena as the perfect example of what it means to be a New York City transplant.